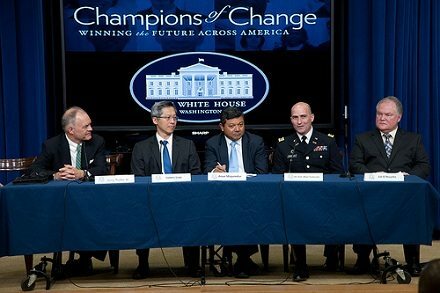 Did you know that the White House regularly honors community leaders, often nonprofit leaders, as “Champions of Change?” There might not be a lot of money left in the federal budget for nonprofits, but at least some nonprofit leaders are getting recognition that reverberates back to their hometowns and adds credibility and profile to their work. That’s the case with the latest White House Champions of Change awards, which recognized leaders running programs serving the homeless. The Mercury News and Santa Cruz Sentinel took note of the award to Sparky Harlan who, for 29 years, has run a program in Santa Clara County, Calif. for homeless teenagers. Having recently gathered community leaders to pledge to end youth and family homelessness by 2020, Harlan will be able to use the White House award to keep attention focused on the needs of the region’s homeless and upholding the commitments she received from other decision-makers. The awards generated similar local news coverage for other award winners. Crain’s Chicago Business noted the honor to Paul Hamann of Night Ministry. Longtime Atlanta-area community development advocate Margaret Schuelke was recognized by the Decatur Metro for her leadership of Project Community Connections, Inc. In a nod to the connection to public sector roles, Beth McCullough got star billing in the Daily Telegram for her work as the homeless education liaison for the public school system of Adrian, Mich. The full list of winners championing the cause of youth homelessness is available on the White House website. The Champions awards are part of the Obama administration’s “Winning the Future” campaign, which honors people and organizations making a difference in communities. We take special pride in one of the past winners of the Champions awards. In the “service and social innovators” category, one of the award winners was Ivye Allen, the President/CEO of the Foundation for the Mid-South—and a valued member of the Nonprofit Quarterly board of directors. to their hometowns and adds credibility and profile to their work. she received from other decision-makers. championing the cause of youth homelessness is available on the White House website. Mid-South—and a valued member of the Nonprofit Quarterly board of directors. NPQ breaks down the process, the history, and the current politics of impeachment, urging nonprofits to think ahead.